As a marketer, I’m sure you’re constantly looking for ways to improve your content, ways to increase your organic search traffic, and ways to drive target qualified leads to your website. Unfortunately, search engines are tricky, and figuring out how they work can give any digital marketer a severe headache. With algorithms constantly changing, it’s almost impossible to always stay ahead of the curve, but luckily, there are a lot of experts doing the research for us and sharing the wealth. Keywords have been the foundation of content creation for nearly a decade, and rightfully so, but times have changed -- which means how to do keyword research has changed drastically. Voice assistants like Siri and Alexa are becoming more and more common and soon, the days of us manually researching answers to our problems will be gone as we merely speak them to devices. Because of this shift in behavior, search engines are altering their algorithms to favor broad, topic-based content. 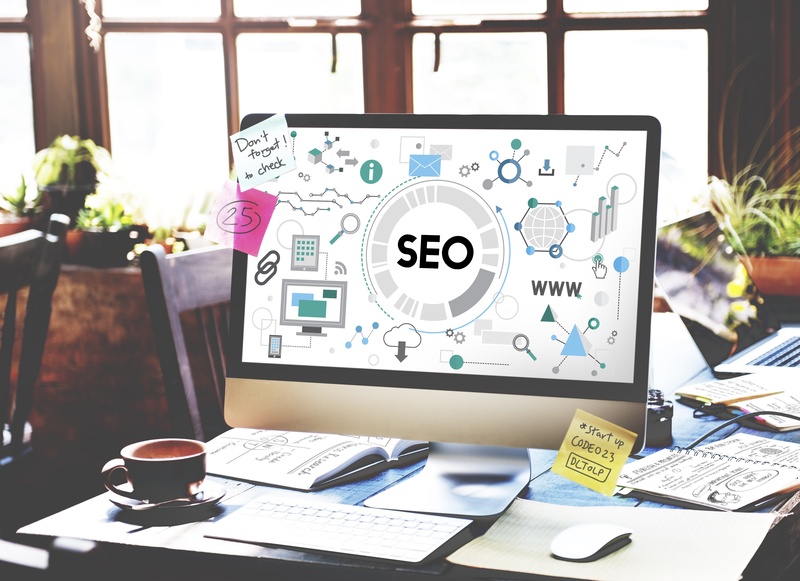 Needless to say, this shakes up previous search engine optimization (SEO) strategies a bit and forces us to focus on how we can provide content to match new searcher intent. That’s where topic clusters come in. So you may be asking yourself, what the heck are topic clusters? Simply put, topic clusters are a collection of interlinked articles or pages around one umbrella topic. They ultimately allow you to provide greater visibility for search engines to identify your content. A topic cluster starts with the main topic, which is also known as your “pillar” page. This is your main focus - a generalized subject. Within this subject, you’ll have a wide range of more detailed, hyper-focused pages that relate back to the main pillar page. All of these pages linking back tell the search engines that your pillar page is an authority on the topic and that they should pay attention to it. Like long-tail keywords and other content strategies before it, the goal of creating these topic clusters is to better organize your content for search engines and rank higher. The more cluster topics you have, the higher you will rank over time as search engines recognize you’re providing all the answers people are searching for. This also creates a “one-stop-shop” per say, that provides searchers with a better experience as they are researching a topic and/or problem. No need to visit multiple sites! Let’s dig deeper into the anatomy of a topic cluster through an example. From here, you branch out into subtopics, which allow you to dive deeper into the details and different areas of the greater subject. Now, think about when you’re googling questions to solve a problem you’re facing. Usually, you ask specific questions or situations. 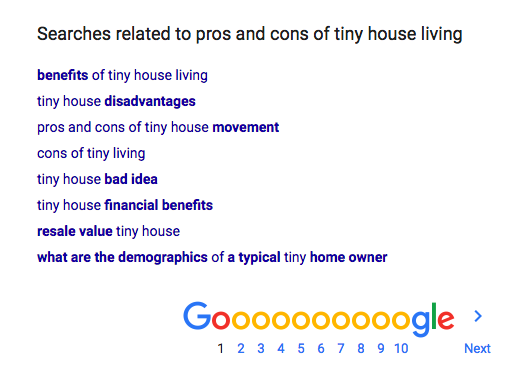 For instance, with tiny homes as our example, you may be googling any of the following: “small starter homes,” “cost of tiny homes,” “reasons to buy a tiny home,” “pros and cons of moving into a tiny home,” “living a minimalist lifestyle,” “how to downsize,” “tiny home design inspiration” -- the list could really go on and on. These more detailed topics are your subtopics; pages or articles that go even deeper into your core topic and most likely include your current “long-tail keyword” content. All your subtopics, you should link back to the main pillar page. This is what helps tell search engines that that page is a dominant authority in the topic area. At this point, you may be thinking “wow this is really going to take a lot of time and resources to implement topic clusters,” but trust me, it’s harder to explain it then implement it. Let’s dive into how you begin the process of putting together topic clusters for your business. As you’ve done keyword research in the past and created content around those opportunities, you’ve ultimately already set a foundation for your topic clusters. You know what your buyer personas are researching and you’ve hopefully focused content around it already, so, the first step is reviewing what you have. You might have to make some copy changes, but if you already have a good amount of content don’t throw it away! Look at its performance and accuracy and start repurposing. A high ranking, high traffic page may make the perfect pillar page with a few updates. As you’re taking a look through your content (whether that’s website pages or blogs you’ve published in the past) organize them into your different main “pillar” topics. A good number to aim for is about 5-10 subtopics for each pillar. 3. Uncover Topics and Brainstorm! As you're going through your content, you can also identify topic cluster opportunities you may have previously overlooked. Take a look at your analytics to identify which articles have performed well and if there are commonalities between them. This will help you consider additional pillar topics as you know they’ve performed well with your audience. You can also conduct research to identify new topics. Think to yourself, what are some of the main questions people would be searching/ asking as they are looking to solve their problem? Look back at the buyer personas you’ve built out - what are some of the common questions they’re asking? Consider using some of those questions as potential subtopics, or even pillars if they are more general. As you’re building out pillar pages and subtopic pages, don’t forget to also utilize keyword research you’ve used in the past and integrate them into your content. Google itself can be your best friend when brainstorming these topics. Simply type in a pillar topic that you want to cover. Look at the “people also ask” feature, these are commonly searched questions within your main topic. If you haven’t created content around these, add them to the list of content for your subtopics. Also, take a look at the “related” section. These can provide you with additional subtopics as well. Now, this is HUGE and something you cannot forget. As you’re laying out all your subtopic pages, it is critical that you link them back to the main pillar page. You also want to make sure your main pillar page also links out to all of your subtopic pages. This is what ties all your topic cluster efforts together and tells Google how your pages are related to one another. For example, if your main pillar page is around tiny homes, you want to make sure that your pros and cons of tiny home living blog post are linking back to the main tiny home pillar page, and vice versa. If you’re a HubSpot user, you’ll be excited to know that HubSpot recently launched a tool which helps you build out your topic clusters and track your efforts. 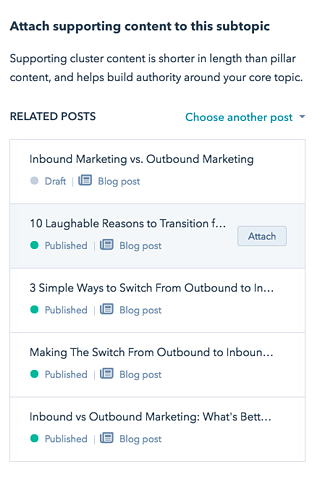 Content Strategy, currently in beta, will help save you a lot of time in terms of identifying subtopics ideas and existing content that you can connect to topic clusters. 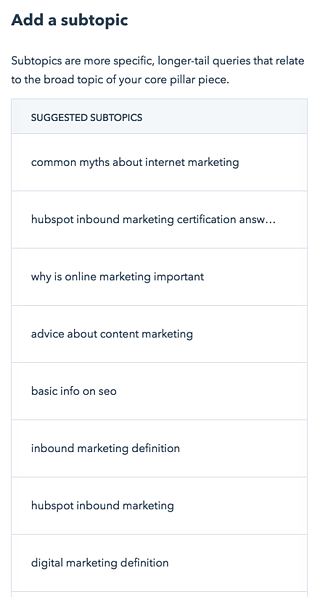 The HubSpot Content Strategy Tool helps you easily find topics and subtopics to build campaigns around based on competition, relevance, and popularity. Below I’ve pulled some of our efforts for IMPACT. As you can see, we have for the main pillar below is Inbound Marketing. It shows you the domain authority, monthly search volume, and relevancy to that main topic. As you click on a subtopic to add, a suggested Subtopic column appears on the left, which helps you identify new areas to focus on. After you select a subtopic, you are able to attach/link related posts to it. It will even suggest related posts you have in-draft. As you can see, this tool comes in handy as you are brainstorming, unveiling topics you may not have thought of yet, or even confirmation on the ones you’ve picked. Once you’ve setup your topic cluster, connect to a campaign so you’re able to track your efforts. This will allow you to analyze how a specific topic cluster is performing in terms of leads and traffic and help you see which are how many leads you’re driving the most to your business based on the topic. If you see one of the clusters is performing really well, consider maximizing on it and creating more subtopics to cast an even wider net. Tracking analytics and solid data will allow you to stay ahead of the curve by adapting your content strategy, and prioritizing what is working. For the topics that aren’t performing as well, identify if they are really that important to your leads as they are doing their research. It may be possible that the content area isn’t as helpful as you initially thought. Consider shifting around the subtopics to include other detailed aspects of the pillar or consider focusing on another topic cluster. But guess what? Creating topic clusters can be fun and satisfying. When all is said and done, you are serving up better content to your audience, which puts you as the expert in the topic and helps you build trust along their journey. Whether you are a HubSpot user and have access to the beta Content Strategy Tool, or you’re using the brainstorm advice we walked through earlier, you can be on your way to strengthening your search engine optimization. What Does Google’s Visual Search Push Mean for You? Do Links Really Matter in Search Rank in 2019? Google Weighs In.